Synthetic peptide within Human Chemokine Receptor D6 aa 1-100 (N terminal) conjugated to keyhole limpet haemocyanin. The exact sequence is proprietary. Human breast carcinoma and hepatocarcinoma tissue and mouse liver tissue lysate. ab38567 was purified through a protein G column and eluted out with both high and low pH buffers and neutralized immediately after elution then followed by dialysis against PBS. Our Abpromise guarantee covers the use of ab38567 in the following tested applications. WB 1/100 - 1/500. Detects a band of approximately 43 kDa (predicted molecular weight: 40 kDa). Receptor for C-C type chemokines including SCYA2/MCP-1, SCY3/MIP-1-alpha, SCYA5/RANTES and SCYA7/MCP-3. 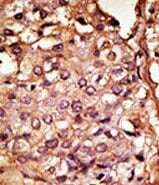 Expressed primarily in placenta and fetal liver, and found at very low levels in the lung and lymph node. Found in endothelial cells lining afferent lymphatics in dermis and lymph nodes. Also found in lymph nodes subcapsular and medullary sinuses, tonsillar lymphatic sinuses and lymphatics in mucosa and submucosa of small and large intestine and appendix. Also found in some malignant vascular tumors. Additional bands at: 27 kDa, 80 kDa. We are unsure as to the identity of these extra bands. Formalin fixed and paraffin embedded human breast carcinoma tissue stained with ab38567, followed by AEC staining. Publishing research using ab38567? Please let us know so that we can cite the reference in this datasheet. There are currently no Customer reviews or Questions for ab38567.